In addition to our usual DIY escapades, every now and then we publish a reference article that lays out the available tools or materials for a project. This article covers kitchen countertop materials–everything from laminates to stainless steel. We originally ran this article in 2008, and we’ve just updated it to include some of the newer options available, including trendy options like recycled glass and concrete. We hope you enjoy the article and find it a useful reference. Countertops generally differ in the following characteristics. We’ve attempted to provide some discussion of each of these elements in the pros and cons listed with each material below. There are literally thousands of countertop pictures on the web. Rather than duplicate those collections here, we’ve provided links directly to manufacturers’ and retailers’ picture galleries to help you find all the pictures you’ll need! We include a single picture with each countertop just so you can have a reference point for that material. Before getting started on the specifics of the materials, we’ve found a few tools online that really make countertop shopping fun and engaging. We think you might enjoy using them for your project as well. Pros: Very inexpensive; enormous variety of colors/patterns; variety of edge types; virtually maintenance-free. Cons: Less luxurious look; shows seams; less shimmer than solid surface or stone countertops; less expensive versions are easily damaged. Price Range: $5 to $30 per square foot. Typical price is $15 per square foot. Laminate countertops (often called Formica countertops after their best-known brand) are the most common in the United States. They are constructed by applying a printed veneer surface to a manufactured wood substrate. As one of the cheapest options available, builders often install laminates in low- to mid-grade homes to keep construction costs down. Because it is a manufactured product, laminates are available in an enormous variety of colors and patterns. Knives and high heat can cause noticeable damage, although scratch resistant laminates have recently become available (such as WilsonArt’s HD line with AEON technology). While laminate countertops are no less functionally capable than more expensive options, most home buyers consider the surface to be “builder’s grade” and wouldn’t view it as particularly desirable. We think this perception holds true even though laminates now offer some of the features that had previously been available only in solid surface, such as integrated sinks (see WilsonArt’s integrated sinks for example). If you’re upgrading a kitchen in a home worth more than $250,000, we think laminates should be avoided in favor of granite, quartz, or another solid surface. Laminates are still appropriate for trailers and less expensive town homes and single family homes. Pros: Beautiful all-natural stone look; resists scratches; resists heat damage; with proper care lasts an exceptionally long time. Cons: Larger installations are not seamless; colors/patterns limited to what occurs in nature; requires sealing (although some newer versions claim 10 years of maintenance free use). Price: Range: $20- $50 per square foot. Typical price is approximately $40 per square foot. Intricate edging raises the price. 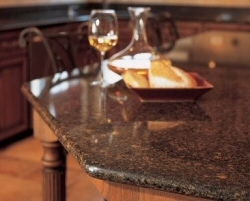 Granite is becoming a very popular option for the natural beauty and durability these countertops offer. It can be found all over the world with the majority originating in India, Brazil, Italy, China and some parts of Africa. Granite features a vast number of colors and veining with no two stones being exactly identical. Buyers should keep that in mind when they’re looking at samples. Blocks are cut into slabs and treated with a resin before they are polished to a high sheen. Long countertops will often have seams because continuous pieces over 10′ long are difficult to find and they carry a higher price. You can minimize the visibility of seems by selecting a darker and more uniform color. Granite is formed in extreme heat making it very unlikely to crack or discolor from hot pots and pans. It can chip if you’re not careful with sharp objects. Fortunately, these imperfections can be fixed with a granite dust and epoxy. As a natural product, granite has pores that can absorb liquids and stain. Seal your countertop as recommended to prevent discoloration. Pros: Beautiful, natural surface; sustainable if a fast-growth tree is used. Cons: Very high maintenance; scratches easily (but can be repaired); porous surface can lead to bacteria growth; surface must be kept clean and dry; not appropriate for cutting fishes and poultry except if special precautions are taken. Price Range: $30 -$50 installed. Butcher Block provides a warm, traditional feel that has remained popular for some time despite the intense care and maintenance required. You can cut directly on the surface, and some people feel the wear and tear adds character. Butcher Block is a natural product created by fusing wood rails together under high pressure. End grain blocks are formed into the classic checkerboard pattern creating a very durable surface- great for cutting and chopping because the end grains better absorb impact keeping blades sharper. Edge grain Butcher Block features long parallel wood rails resulting in a very flat, uniform surface. Butcher Block is porous and will absorb moisture causing the wood to expand and weaken. It’s important to keep these countertops dry and clean, and a good steel scraper can help remove most of the moisture. After every use, you should clean the surface with soapy water followed up by a dry cloth to absorb moisture. Every few weeks you should oil the surface to act as a moisture barrier. Butcher Block can be restored to “like-new” condition by sanding the surface with a heavy duty grit sandpaper and re-oiling with pure white mineral oil. Pros: Professional, contemporary look; non-porous; easy clean-up. Cons: Extremely high price; scratches easier than others; can dent without a solid sub-surface. Price Range: $75 – $150 per square foot. Stainless steel countertops are a relatively new trend, creating a professional, contemporary look. Joints are welded, blended and polished to invisibility providing a lot of versatile layout options. Stainless is also an attractive choice for the low maintenance required, but it comes with a steep price point. Hi grade stainless steel is a tough material that will stand up to high heat and won’t ever stain or rust. The biggest challenge for stainless steel countertops is avoiding scratches which are highly visible. Even deep scratches can be sanded and buffed but you’ll never really reclaim the manufactured finish. It must be installed with a solid sub-layer to help avoid dents- usually waterproof MDF. Pros: Seamless installation including seamless sink; wide variety of colors; can be repaired seamlessly; non-porous surface won’t promote bacteria growth. Cons: Higher price; can melt/discolor under high heat. Price Range: $35 – $60 per square foot. Fancy edges extra. Integrated backsplash extra. Solid surface countertops are manufactured with an even, consistent color and pattern. They available in a wide range of colors and patterns including stone-like finishes. Seams in these countertops can be usually be completely hidden, as the artificial surface can be chemically melted together. Solid surfaces countertops are non-porous, meaning you won’t need to seal (and reseal) them to protect against stains; the sealing also makes the surface resistant to bacteria growth. The finish on a solid surface is subject to scratching, but can usually be removed with buffing and sanding. Cleaning requires minimal effort; use a mild soap and water. You can tackle tough stains with a liquid abrasive cleanser and a sponge. Pros: Highly durable, fabulous-looking surface; no maintenance; wide variety of colors; heat and scratch resistant. Cons: High price; more limited selection than artificial surfaces; larger installations may not be seamless. Price Range: $60 – $100 per square foot. If you can afford the expense, Quartz-based Solid Surface countertops are a very attractive option. 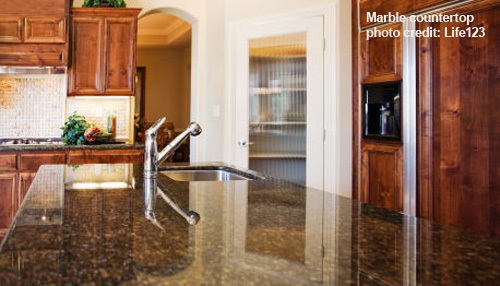 There’s no worry about stains or bacteria because these countertops are non-porous. There are a lot of colors to chose from, and these surfaces are heat and scratch resistant. It’s not recommended but cutting directly on these countertops will actually dull the knives! There are a few, minor limitations. While slabs are large (5′ x 10′), if you’re kitchen does require two adjacent pieces, seams will be visible. Another downside is the lack of an integrated sink. Currently, you’ll need to pick an over- or under-mount sink. No deal-breakers here! So how do they pack all these great features into one surface? Quartz based Solid Surface is manufactured from crushed quartz stone and resin than is combined to create a super hard countertop material. Surfaces are beautiful even without the natural variations found in a material like Granite. Price Range: Starting at about $5 / square foot for materials alone. Installation can be $20 per square foot. Often, this is a DIY job. Probably the biggest complaint about natural stone surfaces like Granite and Quartz is the expense, and a contributing factor to higher prices is mining and processing large slabs of rock. If you can embrace grout lines, you can have a beautiful stone countertop for much less. Depending on the material used, you can obtain a pore-free surface that is heat and stain resistant at a significantly lower cost, especially when you explore ceramic and porcelain tile options. It’s also the sort of installation job an avid DIYer can tackle themselves. So what are the downsides? While the surface may not be porous, the grout will stain if not properly sealed, and installation requires more work. You should also consider a waterproof membrane in the sub-layer. Tiled countertops are not mainstream even though they offer a lot of versatility in material, color and style. Pros: Very durable; custom shape, color, embedments; often incorporate recycled materials. Cons: Must be sealed; expensive; can develop hairline cracks. Price Range: $75 – $200 installed. 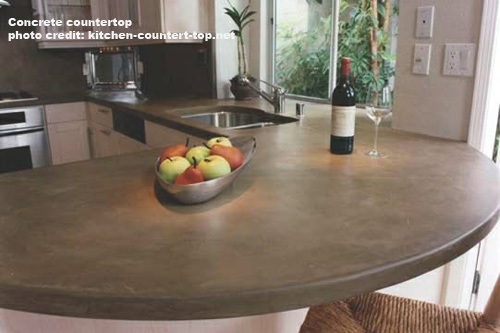 Concrete is finding it’s way into many modern homes and offices with the number of concrete countertops on the rise. They can be dyed and textured to lots of different styles, and inlayed for unique personalization. Creative installations can even include custom molds and edge forms. Concrete is the most creative kitchen countertop material available. On top of that, it’s easy to incorporate fly ash that would otherwise end up in a landfill. Concrete is a porous material and requires regular sealing. While concrete is somewhat stain and heat resistant, it really depends on what type of sealer is applied. Concrete-specific waxes can also be used as a second line of defense, repelling liquids and protecting the sealer. Cutting boards should be used to prevent marring the surface. A lot of the cost for concrete countertops is tied to the labor-intensive installation, and it’s important to pick an experienced installer else cracks can develop down the road. Even with the perfect installation, concrete will shrink and may result in hairline cracks. When you clean concrete countertops, avoid abrasive soaps or cleansers. Acidic substances can stain so clean up things like wine, lemon juice and ketchup immediately. Pros: Sophisticated look; natural stone; lots of colors available; potentially visible fossils. Cons: Easily broken, scratched; acid can etch; must be sealed. Limestone is another natural stone material, and it’s available in many different colors and hues. It’s often described as very sophisticated because of the depth and variation evident in each piece, similar to marble. Additionally, Limestone is a sedimentary rock and often includes small fossils and shells for even more character. Limestone will usually scratch very easily, acid can mar the surface and the hardness depends on the variety chosen. Limestone is very porous meaning it can stain even when properly sealed. For these reason, it’s often not selected for kitchen countertops because they are such high traffic areas. All varieties withstand heat very well and avid bakers prefer Limestone to cool baked good like pie crusts and pastries. Pros: Perfectly smooth; beautiful look. Cons: Easily scratched; must be sealed, susceptible to acid; higher price. Marble is very similar to Limestone as it’s a natural stone and available in many different colors. It also falls prey to many of the same problems as Limestone- easily scratched, damaged by mild acid. Marble is very porous resulting in poor stain resistance even with regular sealing. On top of it all, Marble is not heat resistant. Combined with high prices, it doesn’t seem like a good investment. Even so, Marble has beautiful vein patterns, and if you insist on using it for countertop, chose a low-sheen finish that will better hide wear and tear. Pros: Often 100% recycled glass; beautiful mosaic. Cons: Must be sealed; susceptible to acid; not heat or scratch resistant. 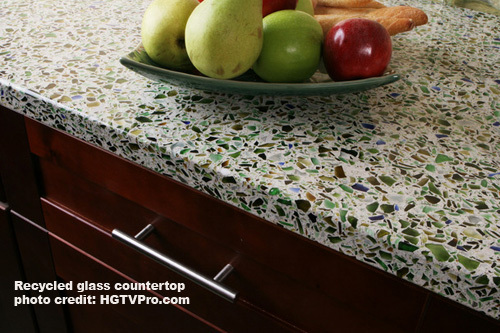 Recycled glass countertops are becoming more and more popular as an eco-friendly option with most countertops utilizing 100% recycled glass. Surfaces are often a mosaic of glass pieces with as many (or few) colors as desired. This glass is placed in a matrix of concrete, and therefore feature some of the same properties. It’s a porous surface and requires regular sealing, otherwise it will stain. Highly acidic substances can deteriorate the original seal and stain the surface. Also like concrete, it’s easy to incorporate fly ash to make this an even greener choice and there are several edge styles to chose from. Recycled glass countertops can also benefit from regular waxing for additional protection. Quickly wipe up any spills and use a neutral pH solution for daily cleaning. To remove difficult stains, one manufacturer recommends placing a cloth saturated with non-chlorine bleach overtop the stain until it clears. You should always use a cutting board and hot pads to protect the surface. We compromised and did granite tile. We were only able to easily access 12″ tiles– not the big tiles like your last before and after story or like the countertops on 10k Kitchen Remodel, but they look nice, I think. I’ll never want to roll out big pieces of pastry, but I otherwise really like the cold feel of real stone and we just couldn’t afford solid granite. We were able to get it on a Labor Day sale, so it was ultra cheap and surprisingly easy to work with after renting a wet saw for a day. Add black grout, and it stays looking really clean– which is a pro and con. On the one hand, it’s great that it always looks good; on the other, it’s hard to know that you’ve cleaned it all until you put a hand on there and end up knuckle deep in raspberry jam! Amalie (& anyone interested) — your countertops look great. I had to run over to your blog and find them… not sure if you have a “finished” kitchen picture, but if you click the label “kitchen” (or follow the link below) you can see the granite tile amalie is talking about. I really like the look – it has a lot of character and lines… Do you remember how much you paid per sqft? Something else I meant to mention– while we were researching granite, we found that the darker it is, the more compact it is, and therefore, needs no sealer on the stone itself. We sealed only the grout, and have since discovered some lovely things like, for example, the toaster oven wasn’t sitting level and was dripping butter from garlic bread for days onto the stone underneath, where we couldn’t see…No stains! All that oil cleaned up a dream. One of the frequent posters, Maurizio Bertoli, is a stone expert; I’ve seen him run advice columns for other companies that produce and sell stone sealant, and even he recommends no sealer for dark granites like Black Absolute and Uba Tuba. Just an FYI on limestone, inc case anyone is thinking of it… my father in law works in limestone (runs a stone cutting shop) and he would NEVER make a limestone countertop. The chips, the stains, etc. It’s a very soft stone.. .and he works in the hardest of the limestones. We like our granite countertop a lot… I’m a “sucker” for a natural counter. Anything else like the fake stones or laminates actually decrease the value of the kitchen for me, no matter how expensive they were new! No Soapstone? I think it makes a great counter, its non-porous and requires no sealing (though people like to use mineral oil on it to darken it quicker). Also it is SUPER heat resistant (my parents had a soapstone wood stove), and you can even have your sink made out of it. Soapstone has been used as a countertop for a while, the counter tops in your HS science labs were probably soapstone. This IS a good resource. Thanks for bringing it back to the forefront, AarthiD. I think Corian is a nice choice but all these new counter tops are not the same they have no lip that levels up to stop things from rolling off them like our old Laminate counter tops do our edge goes upwards to prevent things from rolling off. This is great info. We are slowly thinking about new kitchen counter tops. Our builder grade laminate is a very forgiving workhorse. Sadly it is also the ugly step-sister. Those are great looking countertops, but the cost is what caught my eye. Very affordable! Be wary of new Corian colors (marble-like colors) the seams are no longer “completely hidden” as the article describes, but VERY visible. Corian slabs are only 30 inches wide so anything wider than that… do not use the new colors. I have the beautiful Basil color on my new island …beautiful except for the UGLY seam running down the length of it. Shows more than the old laminate seams in my parent’s home. Thought I’d chime in and say we’ve had Silestone counters for just eight years now and are very happy with them. There is a curing time before they are completely hardened. This isn’t something they tell you and I never asked after the fact, but we found it out the hard way when I clipped the edge with a large heavy pan. Luckily it’s a very very small chip and the only way I can find it is to run my hand along the edge of the counter in the general area where it happened. Their counters are now antimicrobial too. We have slab granite that’s been installed for over 10 years now, and it looks s good as it did the day it was put in. I DO have a new issue,tho. When I went to put some sealer on it, it seemed to not spread as easily as it always did, and has left a film on the granite. Does anyone know of a way to clean it now to restore the smoothness and shine? Wow, what a great article and discussion. There are so many options, no wonder people get overwhelmed. Thanks for all the great info! I had Corian when it originally came out, and it was molded with a lip that kept splills from going on the floor. It appears they don’t do this anymore, which is really too bad. I loved not having to pick up after hubby and the kids on the floor. Howver, my husband cracked it when he put a hot pan on it right from the stove. I am making plans to remodel the kitchen. Hope I can keep the cabitnet with resurfacing. I am torn between granite or quartz countertop. After reading the pros and cons, I am leaning towards quartz. What is the cost comparison between the two? If I go with quartz, where is the best place to find it? hotel revnovation and new construction project. The NS3520-R-16 is a large double bowl undermount stainless steel kitchen sink. Crafted of 16 gauge 304 stainless steel this white sink kitchen is of the highest quality. This sink is our deepest drawn double bowl at 10″ in the main bowl, there is plenty of space to work.